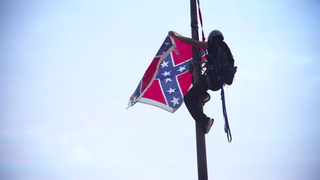 Brittany “Bree” Newsome has spoken out about her powerful climb up a pole in South Carolina to remove a “banner of racial intimidation and fear”: the Confederate flag. The controversial emblem stood—and still stands, waving like a taunting child sticking its tongue out—above the Statehouse grounds. Daily, it reminds those who were tortured under its ideology that those beliefs are still prevalent in that region and nationwide. Newsome has been hailed as a hero by many for organizing with fellow frustrated citizens and doing what thousands of Americans reasoned was necessary: erasing the painful symbol of the nation’s horrific past from public grounds. However, while her momentous act of civil disobedience effectively called more attention to what President Barack Obama described as the “systemic oppression and racial subjugation” the flag represents, Newsome unfortunately wasn’t as successful at actually removing the offensive emblem permanently. Not surprisingly, Newsome and her associate’s actions resulted in her arrest for defacing a public monument. She’s now joined the ranks of Rosa Parks, Martin Luther King Jr. and several other civil rights activists who ended up in police custody after fighting the power. However, were those ’60s-era icons around today, they might have some advice for Newsome about better ways to protest and boycott injustice. There are a lot of lessons that today’s activists have learned from the civil rights movement of the ’60s. The movement laid the groundwork for how to effect change, and the oppressed have followed the blueprint, with the too-frequent exceptions of violent rioting. While protesters of today have adopted many of the peaceful practices in their fight against modern-day injustice, there are clearly a few practices that many have disregarded. What Ava DuVernay helped convey to Selma viewers is that King led a very organized protest that used the legal system to help achieve its goals. Just like Thurgood Marshall, who famously won the Brown v. Board of Education suit that dismantled “separate but equal” before him, King realized that the laws had to be changed for black Americans to claim their rights. It’s not enough just to cross the Edmund Pettus Bridge; you have to do so with the backing of the U.S. government. When you don’t, Bloody Sundays occur. Marshall never arrived at a white school with a busload of black children to integrate it without first going to the courts and making sure integration became law. That’s something that’s missing in today’s protests. In fact, more times than not, the authorities are seemingly too enthusiastic about halting boycotts and demonstrations, by any means necessary, than trying to protect those who are demonstrating. Newsome clearly intended to break the law during her symbolic defiance. While that brought more attention to the renewed debate over the Confederate flag, it will take the repealing of some laws and enacting of new ones to actually remove the emblem permanently. Those types of institutional changes, like those sought within the criminal-justice system whose armed officers have claimed dozens of brown bodies this year, are what will improve society and discourage the hate and discrimination that led to the massacre of nine churchgoers two weeks ago. However, that kind of change takes time, as the civil rights movement proved. For those, like Newsome, who can’t wait, there’s a flag in South Carolina awaiting your arrival.